It’s November, and a good deal of the foliage on western redcedars (Thuja plicata) is alarmingly brown. Does this mean the trees will soon be dead? No. 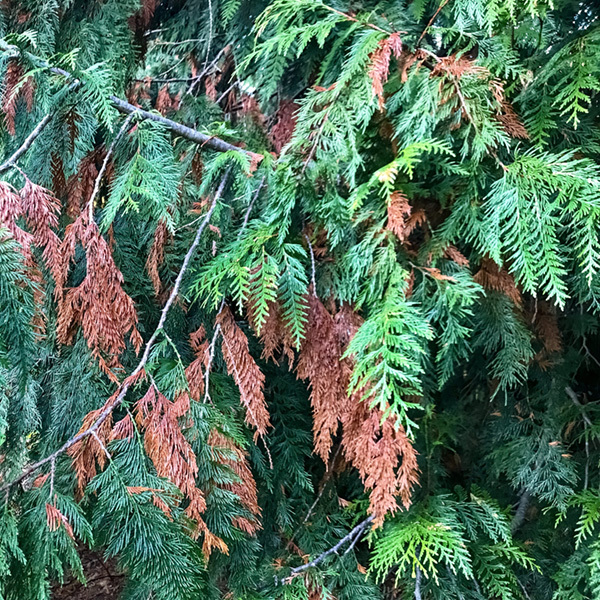 This die-off of western redcedar foliage is an annual event that takes place in the fall. It is the inner foliage that dies. Winter rains and wind will soon cause the dead scales to fall off. This does not mean that the entire tree is dying. Evergreens are trees that remain green year-round—i.e., they do not lose all their leaves at the same time, in the fall. Most conifers in the Pacific NW are evergreens … with the notable exception of larches, whose needles turn gold and drop off every fall. Some broadleaf trees in the Pacific NW are also evergreens—for example, Pacific madrona (often called “arbutus”) (Arbutus menziesii), which is always green. But even evergreen trees lose their leaves or needles or scales. They just don’t lose them all at at once, like deciduous trees. On an evergreen tree, leaves or needles or scales may last one year or half-a-dozen years or more, depending on the species. Eventually a leaf or needle or scale will die and fall off. On western redcedars (and some other conifers, to a lesser extent), inner foliage dies every fall in entire clumps. This is offset by new spring foliage that grows on the outside of the tree, where the scales can catch more light. Experts believe that this is simply a matter of efficiency. Western redcedars increase their efficiency by cutting off the inner foliage’s use of resources (especially water, during hot summers), allowing those resources to flow to outer foliage instead. If you see western redcedars in your yard, along roads, or in the woods that have dead inner foliage, don’t worry. This is a normal annual process in the life of the tree. The trees should look much greener by next spring. Older PostHow do you clean sap from your hands / clothes?